Okay, it was dark already and I still hadn’t taken a picture for the day. While doing other things today, I just didn’t see any shots to take. Granted, I wasn’t looking too hard, so that may have been a factor. So, while I was at a shopping plaza in the evening, I spotted this cart against a post along a walkway. 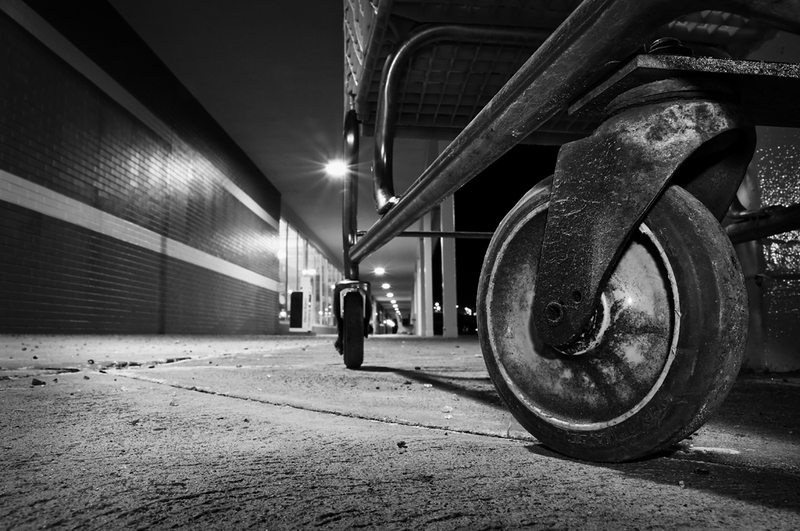 Shopping carts in general aren’t too exciting, so I looked for a different perspective. Hoping to take advantage of the long walkway in the background, I set the camera on the walk and used the built-in flash, set at -1.7 EV, for fill. The built-in flash comes in handy for such situations, in my opinion. Nik Silver Efex used for the B&W conversion in PSE6. Pentax K20D, DA17-70. The grit and grease in the foreground wheel is pretty interesting. Definitely something I /never/ look at closely when I go shopping. Thanks Nathan. I never really notice that stuff either. Of course, I’m never “down there” either. Makes you wonder about little children crawling around in stores while their parents blissfully don’t notice or care.